'Our one-year-old son will insult you with his happiness and freedom every day' - Antoine Leiris. A father's defiant message to ISIS after his wife, the mother of his son, was killed in Paris, 13 Nov 2015. It is an impressive statement. As usual I love everyday of my life but the terrors that happen around the world make me more conscious . Making time to enjoy summer is a must on my list. I often dream of lying on a beach with a wet paint brush, capturing whatever in front of me. However, I was not allowed to take painting gear with me to the beach to enjoy time with family. In situations like this, I thought of a French pochade watercolour box I bought sometime ago and a pad of watercolour A5 papers (a birthday gift) would be perfect. I quietly slipped the little set in the bag unnoticed. When everyone was going for a walk along the beach, it was the time for me to enjoy the scenes of the beach while sitting with bags and sandals. Time went. It was a long walk. When people came back, I showed them the picture. It was a surprise. People find it hard to believe it was an actual scene on the beach that was right in front of us! I was pleased everyone had something to enjoy especially the one that got left behind!.. me.. It's a win win situation. I plan to have more and more the secret pleasures with the charming French pochade painting box while sharing wonderful time with family and friends. I am having the world both ways in my arms! Hug. 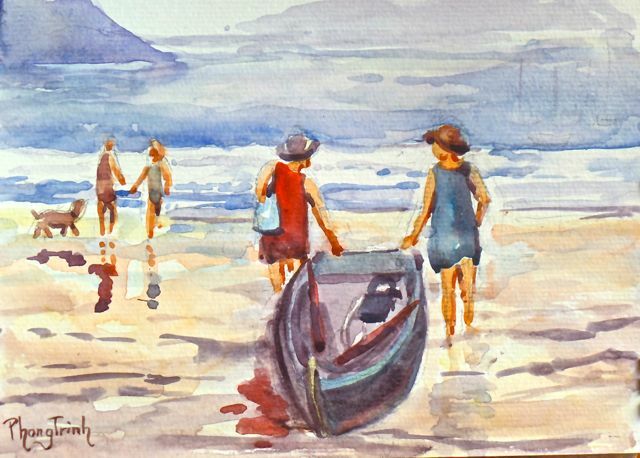 Looking at the two ladies with their little steps toward the sea, I thought of Picasso painting of the first step. In life, we do not have the whole staircase in front of us, only the first step. The first step of independence into uncertainty requires courage.. I thought of the first step of a one year old who just lost his mother.. the first step of a father who decided to love him twice as much.. Everyday is a chance for a first step into the magic of life. Take it. Yes, love life a bit more everyday. My friends, you always win.